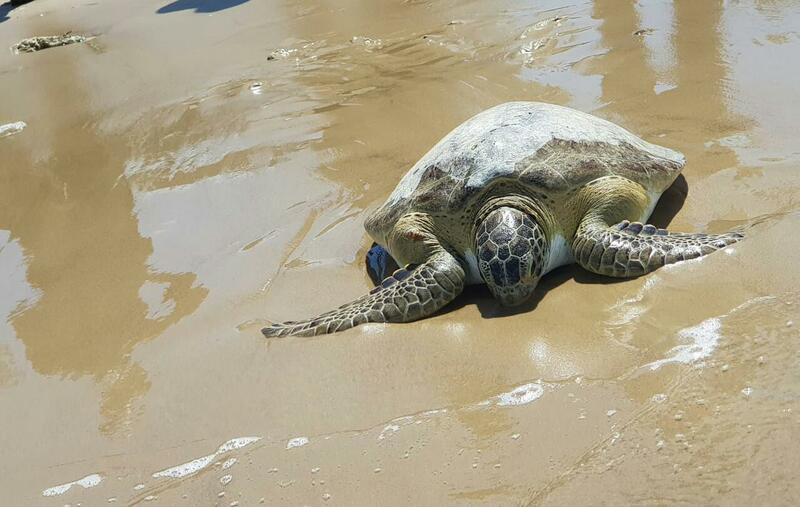 A Chelonia Mydas, also called a green turtle, that was rescued after being found inside a crocus bag in a van with four men on Monday was today released into the sea in Cedros. 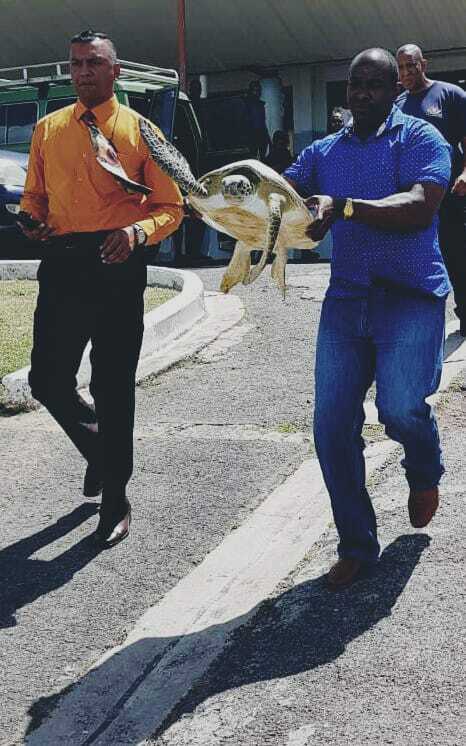 The turtle was freed after it was taken as evidence in the Point Fortin Magistrate Court where four men appeared charged with having the animal in their possession. The case was heard before senior magistrate Rajendra Rambachan. The charge read to Gregory David, 56, Owen Vialva, 47, Philip Phagoo, 26, and Michael Joseph, 38, alleged that on Monday they had in their possession an environmentally sensitive species at L' envieuesse Gardens in Cedros. The men were charged under section 70 of the Environmental Management Act and were not called upon to plead. The turtle was in the care of a team of game wardens including Andy Singh Jeremy Dindial and Bisham Madhu and Hayden Simmons. After the court hearing, the game wardens transported the turtle to Cedros where they released it into the sea. They waited a few minutes before the animal entered the sea waters. The accused men were represented by attorney Kristoff Rambert who, in asking for bail, said his clients had no previous convictions. The men were granted $50,000 surety bail or a cash alternative of $15,000. The case will go to trial where a magistrate will decide if the men are guilty. The charge carries a maximum fine of $100,000 and two years in jail. The case was adjourned to March 11 where the men would reappear. Reply to "Rescued turtle returns to sea, poachers charged"